Paying for Wi-Fi stings, even at 30,000 feet in the air. Luckily, we may not be paying for much longer. 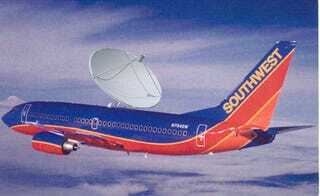 Southwest and Alaska Air are nearing tests of a new ad-supported Wi-Fi system. The hardware and software are installed by third parties with the goal to point fliers to an online catalog called the Skytown Center. Whether you purchased Wi-Fi or not, you could do some shopping on the plane (with the participating retailers and advertisers footing the bill.) But the more tempting benefit is that airlines look to have most or all the costs associated with providing in-flight Wi-Fi covered under such sponsorships. So while there's no guarantee we'll be browsing the entire web for free, it seems a likely scenario that you'll be able to check your email if you're willing to deal with a few extra ads.